In today's fast-paced world, we are all in a hurry. In a hurry to get to where we are going, in a hurry to get successful, in a hurry to get things done. We get dejected when things don't happen our way, when results are not achieved instantly. It's a race and we are scared of being left behind. The age of achievement has decreased. Fifteen-year-olds are developing codes and selling websites. By the time you are 25, you have a company of your own. Or you are an accomplished musician who has travelled the world. People are doing too much in too little time. Only some people. And that is scaring the hell out of us. If at 25, you are still slogging it out in a 9-to-6 job, you feel worthless. All your friends are getting married and posting pictures of their honeymoon to New Zealand or some exotic destination you can't even afford to think of in the next 2 years. Time is running out; the world is running past you and you…you find yourself struggling to even get up from bed. "You are unique, don't compare yourself to others. Everyone works based on their 'Time Zone'. People can have things worked out only according to their pace. Work in your “time zone”. Your Colleagues, friends, younger ones might "seem" to go ahead of you. May be some might "seem" behind you. Everyone is in this world running their own race on their own lane in their own time. God has a different plan for everybody. Time is the difference. 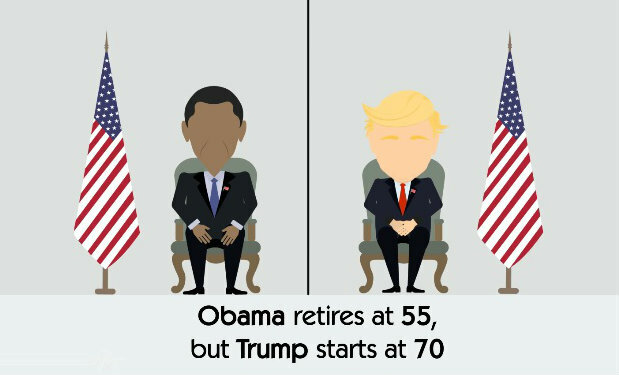 Obama retires at 55, Trump resumes at 70. Don't envy them or mock them, it's their 'Time Zone.' You are in yours!" Early success doesn't mean a happy life. You could open a company at 25, you could also go bankrupt at 30 if the company dissolves. You could find success at 40, and perhaps you'd be more well-equipped to handle it then. Whatever happens, happens for a reason. Maybe that lost job was not right for you. Maybe you are meant to hone your skills for something great later. There is no right time. We get things when we are ready for them. When it doesn't happen for you, it means it's not supposed to happen right now. No point worrying yourself sick and envying another. Spend your time polishing your personality, acquiring new skills, learning a new language – create the person you want to be in future. Create the personality that will match your success. Work towards your goal at your own pace. Everybody has their own timeline. What if you are meant to do something worthwhile in some years when you are older and wiser, but you were too busy feeling bad about yourself and drowning your woes in alcohol. Imagine the regret. This article was republished from mensxp.com.